To observe the working principal of Cascade System. To determine Actual cooling C.O.P, Carnot C.O.P., Theoretical C.O.P., Actual heating C.O.P., Relative C.O.P., Ton of Refrigeration Etc. To determine the efficiency of the system. Observe the working of refrigeration cycle. Evaporator coil : Coiled Tube Heat Exchanger acts as a evaporator. Copper coil is merged in water tank to cool down the gas temp. 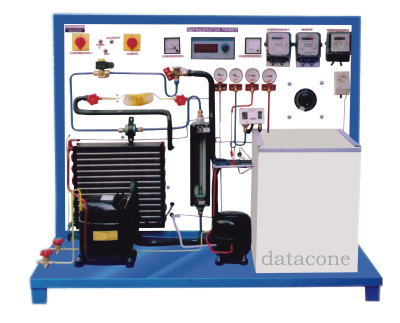 Continuous water flow circulation is required to extract the cooling effect of gases. Ammeter :0 - 15 A. Water Supply : @ 20 LPM with 10 mtr. head.